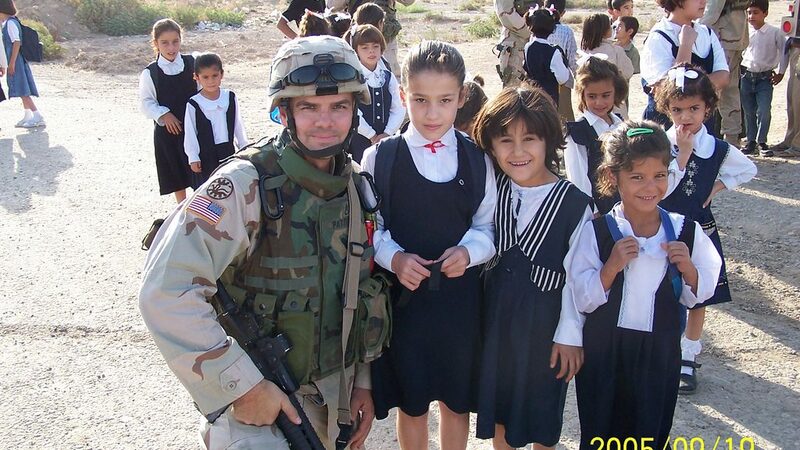 A military trip to Iraq helped me understand when we know WHY we do something, things will always work better. It was 2004 and I was headed to Iraq with Utah Army National Guard. While preparing to deploy, our battalion chaplain Major John Worster, a Catholic Priest from Idaho, encouraged us to find out our reason for going. “Uncle Sam has ordered you to go,” he said. “But you need to find your own reason.” His purpose became the hope of being a small part of creating a more peaceful world for the children of his parish. My reason for deploying, my WHY, found purpose in Operation Crayon. Working with donated school supplies from our local Cache Valley community, we reached out to make a difference in the lives of the Iraqi children. Operation Crayon allowed us to generate wonderful smiles on the children and some goodwill with their parents. To the children, “chocolatte” meant candy of any kind. They loved the desks we provided, the crayons, paper, and pencils, and the candy of course. Soccer balls, “football” to them, were the requisite favorite. The young girl standing next to me in the main picture is Junea. Of all the children we met, Junea is the one I’ve deliberately remembered, hanging on to the hope our time in her country made a better life for her and her family. Despite all that has happened since we were there, I have not lost that hope. Nor have I lost my WHY for going there. When you understand your WHY everything works better. Simon Sinek in his famous TED talk “Start with WHY,” shared this story about Apple that makes the connection between WHY, HOW, and WHAT we do. HOW: The way we challenge the status quo is by making our products beautifully designed, simple to use and user-friendly. WHAT: We just happen to make great computers. Wanna buy one? My WHY in life and business is pretty simple and it has become my personal mantra. The Story I Most Consistently Tell Myself Will Be The Story To Most Consistently Come True In My Life. I Will Create A Beautiful, Powerful, And Great Story. WHAT I do in life and in business, and HOW I do it, evolves directly from my WHY. I had the opportunity last week to share my WHY in a short presentation for the CONNECT Utah group in Logan. It’s only 10 minutes. I hope you enjoy as I share a bit of the story of my journey to Iraq, Father John Worster, Operation Crayon, and Junea. Thanks to Phil Harding of NiTOR for the kind introduction. Do you know what your WHY is? Do you know how your WHY impacts HOW you do WHAT you do? If you would like some help on clarifying your WHY, I invite you to be part of this month’s Red Edge Strategy Workshop April 11, 3-6pm, in Logan. Click here for the details and to register. I will be in Miami for a private client event in April and have opened up a Red Edge Mastermind event to follow it. We’ll dive deep to help you discover your WHY and explore strategic ideas how your WHY can guide HOW you do WHAT you do. We’re limiting the event to 12 people. Investment is $999. If you are in the Miami area, have a friend in the area, or want to be there, drop me a note and we’ll make it work! p.s. Take 13 minutes today to focus on your WHY by first asking yourself the hard question, What Is Your WHY?? ?